Just minutes prior to the Chicago Bulls preseason game against the Indiana Pacers on Saturday, Derrick Rose emerged out of the tunnel of the Banker Life Fieldhouse to a huge cheer from the crowd. Chicago fans had come to watch the game with many seated behind Chicago’s bench. They made the drive of three-hours to see the return of their Bulls’ star Rose after 526 days off the court following his anterior cruciate tear during the first round of the playoffs in 2012. Just prior to tip-off Gar Forman, the General Manager of the Bulls sat down among the fans. No shortage of people were interested in watching Rose. 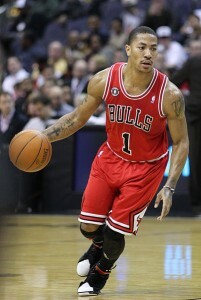 Rose was the Most Valuable Player in the NBA during the 2010-2011 season. He provided a few glimpses of the player he was prior to his injury. Rose scored 13 points in the 20 minutes he played. He also committed four turnovers, showing there was some rust that needed to be shed. Rose said after that he felt normal and great. He told reporters he had been playing that way in Chicago’s practices and was only trying to get his timing back. Rose started at point guard and scored his first hoop driving to the basket. He missed his original shot on the drive but was able to grab the rebound and score. Many in the crowd of 15,000 stood in appreciation after he made his first basket. The Chicago guard played in three different stretches during the game and finished the game hitting 5 of his 12 shots, with three assists and two rebounds. The Bulls defeated the Pacers 82-76, which almost became a sideline to the much anticipated return of Chicago’s point guard. Rose has promised to keep his aggressiveness and said he would attack the basket as he always has in his short but successful career, which defined his game prior to his injury.